The newest member of our Tangent family of products, our Tangent Table Ensemble offers a fresh take on traditional ensemble seating. Sporting clean lines and a modern hexagonal shape, Tangent is a far cry from the bulky 1960s-era ensembles that dominate the market. 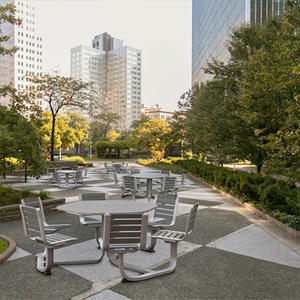 Echoing design themes that span the entire line, Tangent Table Ensembles have hexagonal table tops, while the frames pick up the streamlined hexagonal profile of Tangent Rail Seating rails. Tangent Table Ensembles also offer the same seat choices as our Tangent Rail Seating, increasing the possibilities for solving diverse seating challenges with one cohesive family of products. Backed or backless designs and material options including FSC 100% Ipé wood slats are among the features that set this ensemble apart. 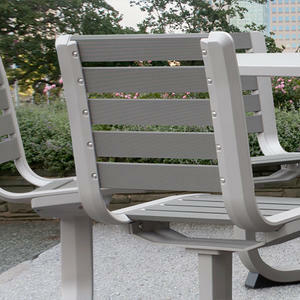 Tangent Table Ensembles achieve an updated look without sacrificing durability. Built on a frame of corrosion-resistant extruded and cast aluminum, it’s designed to thrive in harsh environments and heavy use. 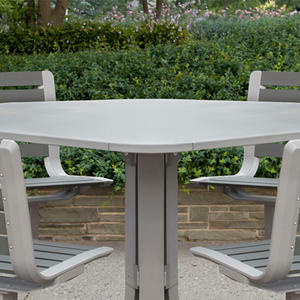 The stainless steel table top is available in several High Durability finishes, including our new Diamond finish, which hides scratches and scuffs from virtually any angle. 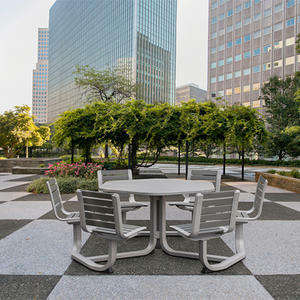 Ideal for healthcare and healing gardens, corporate campuses, and high-end condo complexes, Tangent Table Ensemble meets the aesthetic and performance needs of a wide range of spaces. The 6-seat configuration comfortably accommodates a crowd, without a large, bulky footprint. A roomy 4-seat configuration is available as well, and can be used to address ADA requirements. 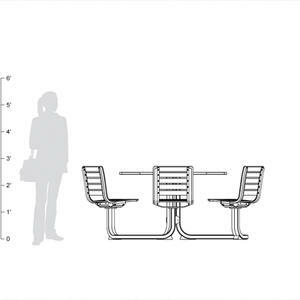 For more details about how Tangent Table Ensembles can solve your project’s seating challenges, please visit the product page on our website or contact us. 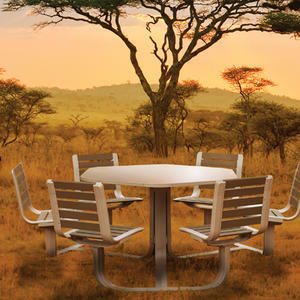 **Check out the new Tangent Table Ensemble, as well as all the other new Outdoor products we’ve launched this year, in our newly updated Outdoor Environments Brochure!